Painting projects allow preschool kids to express creativity while experimenting with various painting techniques. Mixing paint colors provides the opportunity to add educational components to the art projects. Varying the type of paint and the application of the paint maintains the interest of preschool children. Adjust the preschool painting activities to accommodate the kids participating and the supplies on hand. Paintbrushes are the typical preschool painting implement, with fingers taking a close second. But using different items to paint a picture gives preschool children a chance to experiment and create unusual works of art. Collect household items that can be used as painting utensils. Ideas include cotton swabs, cotton balls, toothbrushes, inflated balloons, bubble wrap and aluminum foil balls. Give the items to the children, along with paint in a variety of colors. Encourage the kids to experiment with the various items or ask them to find their own painting utensils. Compare the results achieved with the various items. Liquid food coloring and shaving cream work together to create abstract artwork in this alternative painting project. Squirt shaving cream on a cookie sheet or other shallow tray, smoothing it out to cover the tray in an even layer. Place drops of liquid food coloring in various colors on top of the shaving cream. Use a craft stick to swirl the food coloring in the shaving cream. Place a piece of white paper on top of the shaving cream, pressing gently. Lift the paper, and use a craft stick or other straight item to scrape the excess shaving cream from the paper. The food coloring patterns remain on the paper, creating swirls and patterns in vivid colors. Edible paint allows preschool kids to paint sugar cookies before they are baked. Roll out a batch of sugar cookie dough. Use cookie cutters in any shape to cut out the cookies. Mix together an egg yolk, 1/2 teaspoon of water and enough liquid food coloring to achieve the desired color. Repeat the process with other colors of food coloring. Use a new paintbrush to paint the unbaked cookies with the edible paint. Add colored sugar as glitter, if desired. Bake the sugar cookies per the recipe. 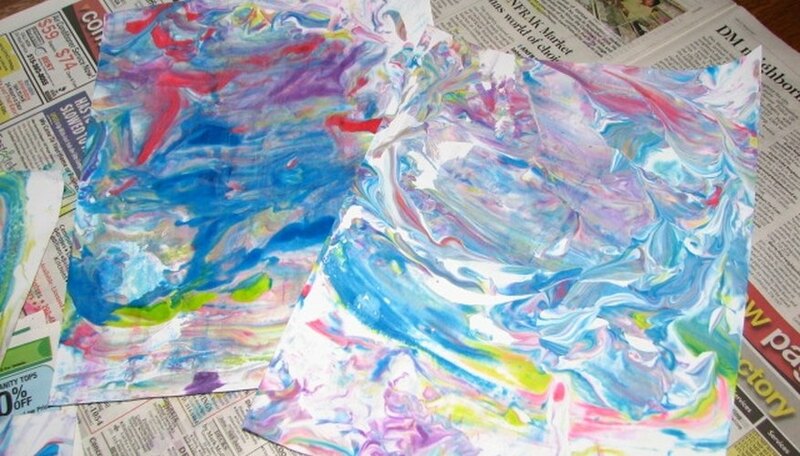 The crayon resist method amazes preschool kids. Give each child a piece of white paper and a white crayon. Have the kids draw a picture with the white crayon. Provide a set of watercolor paints, instructing the kids to paint over the entire piece of paper with the watercolors. The areas covered with the white crayon will resist the paint, causing the picture to appear. This activity allows preschool kids to select and paint a rock. Take the kids on a nature walk, allowing each child to select a rock for the project. Wash the rocks before beginning the painting process to ensure the paint adheres to the rock. Provide several colors of paint for the kids. Allow them to paint the pet rocks in any pattern, adding faces and designs. Glue a piece of felt to the bottom of each rock so it won't scratch any surfaces.